Featured in this month’s Hadassah Magazine is Hadassah Hospital’s world-renowned, cutting-edge physician/scientist, Prof. Michal Lotem, a woman who is trailblazing new treatments that are rendering patients cancer free from typically fatal metastatic melanoma. Yom HaZikaron, Israel’s Remembrance Day, commemorated on May 1st, marked Stewart Greenberg’s five-year anniversary to the day of first meeting Prof. Lotem. Diagnosed with stage four melanoma, he had been told by prestigious medical institutions in the United States that there was nothing more they could do for him, but Prof. Lotem was much more optimistic. She saved his life with a personalized melanoma vaccine! “Michal is our angel,” he says. 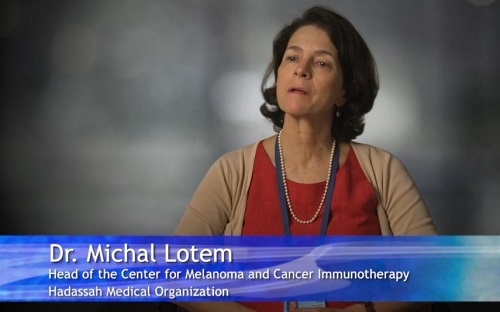 “She is very modest, but the truth is that she is at the forefront of worldwide melanoma research.” Read more in Hadassah Magazine about Hadassah’s Prof. Lotem.